This DVD contains 3 and a half hours of classic television history. Commercials, we all hate them. But it is quite amazing to see how they have changed over the years. Nowadays, they are multi-million dollar productions. This DVD contains 3 and a half hours of classic television history. Commercials, we all hate them. But it is quite amazing to see how they have changed over the years. Nowadays, they are multi-million dollar productions. Back then, they were not quite as polished as they are now. This amazing DVD contains a broad range of products being advertised, from cars, to food, to calculators and cameras. For those of you who were alive at the time, this can bring back fond memories of your youth. For others, these commercials offer a snapshot in time, of modern television history. Regardless of your motivation, these commercials offer a compelling view of vintage television, as it once was. 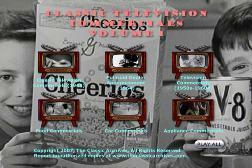 This is a collection of TV commercials significant to the history and development of TV as an advertising medium. This piece is a virtual pot-pourri of classic television commercial history. Covering all areas, and many decades, this piece is full of rare footage. You would not believe how much the first pocket calculators cost back in the 60s. Adjusted for inflation, they cost more than a high end personal computer today. Unbelievable! Introduces Polaroid's marketing campaign for the year 1964, including TV commercials. Produced for dealers.